Across the globe on Earth Day, people are looking for ways to give back to the environment in which they live. Earth Day’s roots go back to 1970 and Senator Gaylord Nelson. The Senator first came up with the idea a year earlier when an oil spill occurred in Santa Barbara, California. At the time, environmental issues were not enough of a concern to bring about any effective change. The Senator had an idea to direct some of the energy and enthusiasm of the anti-war movement toward issues regarding pollution. He and an event coordinator named Denis Hayes promoted an event designed to create an appreciation and awareness of the Earth’s environment. The event, which was the first Earth Day, took place on April 22, 1970 and had 20 million participants who took part in rallies across the U.S. This led to the eventual passing of several important environmental Acts, including the Clean Water Act and the Clean Air Act. Earth Day is now celebrated around the world and continues to be an important day that brings much-needed attention to issues concerning the environment. With concerns such as global warming, Earth Day is as relevant as ever. It is important that people recognize and celebrate this day to help spread awareness and ensure that political leaders take the necessary actions to enact laws that help reduce the dangers to the environment. By celebrating Earth Day, people can also create changes in their everyday lives and in their communities that will have a positive impact on the world around them. 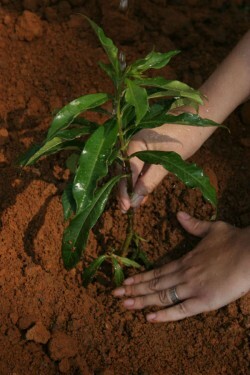 Planting a tree is a great way to celebrate Earth Day. When people plant trees they are doing more than just beautifying an area. Trees are beneficial to the environment in numerous ways. They help produce oxygen and filter out pollutants to clean the air. In addition, trees also help preserve water levels in the soil. Planting a tree in one’s own yard is the obvious solution when it comes to where to plant. Fruit and shade trees are a good choice when deciding the type of trees to plant. Fruit trees have the bonus of eventually bearing fruit, and as a result providing food for the family, neighbors, and friends. When planted in the right location, shade trees can help keep a home cool and reduce energy costs. For people who do not have a yard that can support a tree, there are other ways to plant a tree in celebration of Earth Day. Many local areas have initiatives in place that call for volunteers to participate in tree planting. A garden doesn’t have to be a complex undertaking and it is a great way for families to spend time together on Earth Day. Whether it is a vegetable or flower garden, there are multiple benefits to planting a garden in one’s yard. When planting a vegetable garden, people are able to enjoy foods that are grown right from their own patio or yard, cutting out the middle man and reducing the carbon footprint made by delivery trucks and trips to grocery stores for food. Even people who live in apartments can start a small garden on their patios using recycled barrels, containers or even window boxes. If starting a garden at one’s apartment or home isn’t a possibility, most cities have community gardens where people with a genuine interest in gardening may consider renting a plot or becoming a member. When gardening, avoid practices that could be harmful to the environment, such as using chemical pesticides. Litter is an eyesore on the environment and can end up in the water supply, becoming a health and environmental hazard. By picking up litter, people can prevent environmental contamination, the potential poisoning of wild animals, and also ensure that recyclable items are properly taken care of. Removing litter also removes potentially flammable items that could contribute to wildfires. The removal of litter is a great way to celebrate Earth Day. While it is possible to do so by oneself, litter removal will have a greater impact if it is a group undertaking. A family can work together to clean litter from their neighborhood, or a person can set up a group outing for neighbors, church members or other people in the community to clean up the litter in local parks or other areas. Volunteer opportunities may also be available to clean up the litter in certain communities. Earth Day is the ideal time to start spring cleaning and it is an activity that the whole family can join in on. While most people associate spring cleaning with indoor cleaning, one’s outdoor environment also needs cleanup assistance following the winter months. Things such as fallen leaves and broken branches can hinder the growth of plants as well as one’s lawn, in addition to being less than visually appealing. Remove leaves and debris from gutters with a gloved hand. A rake may be used to remove leaves and dead grass from the yard and from flower or garden beds. Excessive whole leaves can mold or smother a lawn and promote certain types of disease. In addition, other items, such as pine cones, should be removed from the grass. Dead and broken branches on trees and flowering plants should also be removed to ensure that new blossoms and leaves are able to grow. Cut back overgrown plants and shrubs. If desired, give them a heavy pruning; however, first talk with a nursery professional to determine how much pruning is safe for the type of shrub in question. Leaves, grass, and twigs are great for creating compost, while things such as pine cones can be given new life when used in craft projects. Outside Spring Cleaning Checklist: This is an article that appears on the Fox News Latino website. Readers are given a list of things to do when spring cleaning outdoors, plus tips. Earth Day Tips to Help Your Family Go Green This Year: Readers of this article by the Christian Science Monitor are given a list of ideas on how people can go green on Earth Day and every day. The article includes tips such as planting a tree or garden, spring cleaning the home, or spending time outdoors. Celebrating Earth Day and Other April Gardening Tips: When reading this article, people are given a brief history about Earth Day and how people have celebrated it in the past. The rest of the article discussed gardening tips and activities for the month of April. Five Ways to Celebrate Earth Day: Five ways of celebrating Earth Day are listed in numbered format. Ideas include organizing a litter or clean-up committee, planting a tree, or organizing a fund-raiser for a conservation group. EPA: Reducing, Reusing and Recycling Materials: Explains the three-R’s – Reduce, Reuse, and Recycle. Examples of how to do each are given. Celebrate Earth Day! : This EcoKids article lists activities for school age children. The activities are ones that can be done at school, but many are also good ideas for home activities. Spring Cleaning & Organization Guide: A spring cleaning slideshow that covers the interior and exterior cleaning needs of the home. Martha Stewart Spring Cleaning Checklist: A PDF checklist that lists room-by-room spring cleaning steps. A section for spring cleaning outdoor spaces is also included. Recycling 101: People reading this article can freshen up on the basics of recycling. Tips that are given will also help people to cut down on overall waste. Ways to Help the Environment: This page includes a list of ways that people can help preserve the environment. Ideas include recycling, and removing litter from beaches. It’s Spring: Tame the Clutter and Tackle the Grime: This is an article that gives readers advice on how to easily handle spring cleaning in the home. How to Recycle Anything: This is an alphabetical list of how to recycle just about anything. It is a good reference tool when recycling on Earth Day or any day. How to Plant a Tree: An article on the website for the Chicago Tribune website that explains how to plant a tree. It offers advice from the Arbor Day Foundation. South University – Celebrate Earth Day: This South University article lists ten things that people can do to celebrate Earth Day. How to Celebrate Earth Day: A list of fun ways in which one can celebrate Earth Day.